With Valentines Day fast approaching, there can never be too many roses! Here are a few less obvious ideas for ways of using them. …Apart from presenting a bunch of flowers that is! 3. Make some sweetly scented potpourri as a gift. Last year I made Sweetheart Potpourri [dried buds & petals]. 4. Make a decoration such as a rosebud heart [dried buds]. This would make a lovely display at a Valentines party. 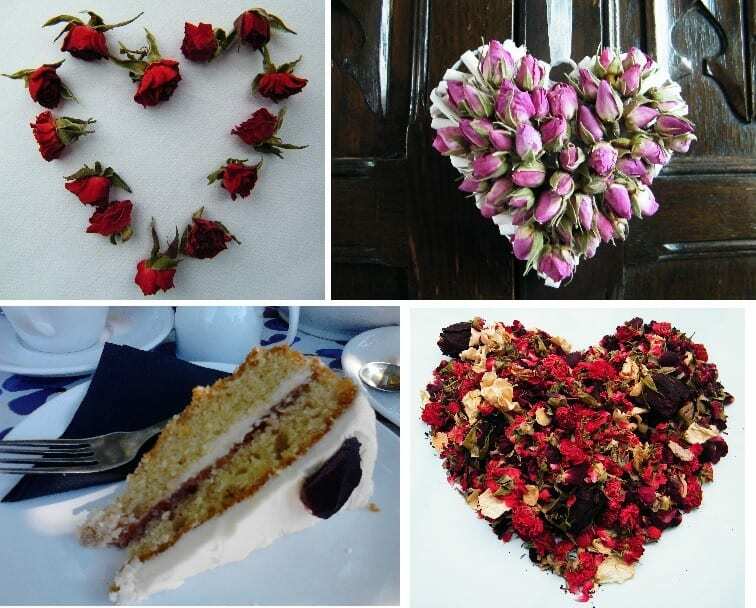 Ideas with roses | Images clockwise from top left: decorate a table cloth with tiny bright red dried rose buds; make a rosebud pomander; decorate a cake; make potpourri.